Three people from different walks of life each experience the end of America. Cassy is a 33-year-old prepper and single mother, away on business. Ethan is a hacker and conspiracy nut living underground. Frank is a family man out camping with friends and family. When a devastating EMP attack in the middle of the night destroys America's infrastructure, they are propelled on an unforgettable journey across an ocean of chaos to reach safety...Safety from an unknown invader and from once-fellow Americans now hungry and desperate. Dark New World is a prepper story of survival and the fight to retain humanity in the face of an apocalyptic event. Got this as just something in between - waiting for my pre-order to come in. Pleasantly surprised. Story is about several characters, main one is a mother trying to get to her mother's house to save her children after an EMP. She winds up meeting several groups along the way and invites one group to join her (which they do at a much later point.) She is a semi prepper although not a trained soldier or what I would call a true survivalist at this point but she learns quickly. Fast moving story with more behind the scenes action like a full out attack of (unknown origin soldiers) against the US. Story is told from several view points which is refreshing. Although a lot happens in a short time, the story moves on tying all the pieces together. I believe this is going to be a great series. I usually try to buy books that are at least 8 hours long for my travels and this would be a short criticism. I always feel my credits should be saved for the longer books but at some point I will get the next one in this series. 14 sur 14 personne(s) ont trouvé cet avis utile. As always, Kevin Pierce is an excellent narrator! I always enjoy his work! He's an excellent story teller and does a great job with character voices! I love a good post apocalyptic or post disaster story. Looking forward to book 2! Dark New World goes beyond the typical EMP story. It addresses the cause of the EMP and the added challenges faced by the characters. It is written in a very realistic manner--which makes it even more intense than typical books in the genre. I have already purchased the next two in the series. I have an urge to stock up on MRE's and canned food after finishing this. If you could sum up Dark New World, Book 1 in three words, what would they be? Cassy, she had the strength and knowledge to survive and work her way to her family after the world as we know it ended! Which character – as performed by Kevin Pierce – was your favorite? Getting home after the world gone to pots! It is good to be prepared for things to come. An EMP has gone off and now power is out everywhere around them. Follow numerous people as they try to survive in this ever changing dark new world. The narration was done by Kevin Pierce. This is the second prepper series that I’ve listened to that Pierce has narrated and I will reiterate that he has the perfect “prepper” type voice. Granted one of the main characters in Dark New World is a female, his voice still captures the prepper mentality really well and adds a lot to this novel. There were definitely some scenes in this story that were incredibly realistic, I just feel that the timelines were a little shorter than one would expect. But, I’m an optimist. In Dark New World, things seem to fall apart much faster than I would expect. (Things started to go south within a day, I would probably expect 2-3 days before the “real” humanity would come out to play). Not much is said about the enemy that these people are running away from and being engaged by, and I think that it’s left that way so that the reader can imagine any number of enemies that they want to. The EMP attack that starts this book off was really well explained and I think that some of the peoples reactions to it were also really spot on. 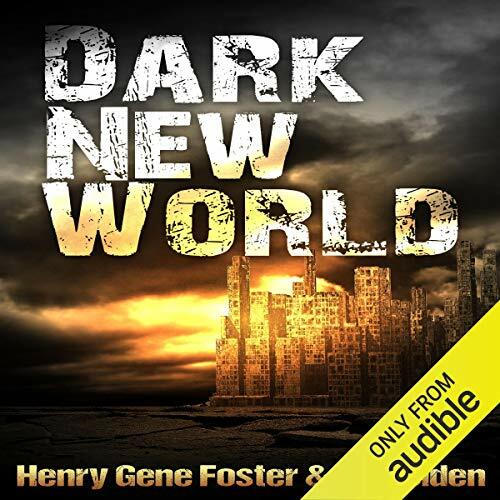 Part prepper and past post-apocalyptic (they kind of go hand-in-hand), Dark New World was an interesting read full of strong characters and what would happen to good and trusting people once society beings breaking down. Once again Kevin Pierce does a great job as a narrator. The book itself has just enough uniqueness to allow it to remain interesting to someone who has read just about every other story in the genre. Good job. love to hear Kevin Pearce read anything! he keeps his characters entertaining and keeps me interested. this story is developing nicely...onto book 2! Dont let the short time of the book deter you. The storyline is typical for the genre but it is well written and moves along nicely. Glad I bought it.